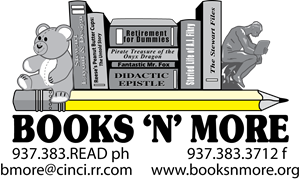 Books 'N' More, an independently owned bookstore, opened its doors in 1996. After 18 years of being open in downtown Wilmington, OH, the store has closed its doors and is now an online store. We will continue to support our community and provide both books and e books, support author visits to our area, and provide books for schools and other group organizations. ORDER NOW AT BOOKS 'N' MORE on line and receive a 25% discount. To avoid shipping charges you can pick up your order at Jen's Deli in Wilmington. The Human Rights Pocketbook Project wants to know what’s important to caring citizens in ethical business, civil society, and effective government institutions in the USA. Then using the established scientiﬁc process of repetition of good ideas to build common sense, we want to partner with you annually to distribute the human rights pocketbook to your stakeholders. like how to respect, protect, and promote human rights in your sphere of inﬂuence. The reason that youth in the United States are the target audience for the Human Rights Pocketbook Project is because (1) the USA is ranked 121st, in the bottom third, of the 2018 Global Peace Index (2) lack of respect, protection, and promotion of human rights is the primary reason for a lack of peace in the world, and (3) youth are our next generation of leaders. The Human Rights Pocketbook Project is grateful to the 50 Rotarians who created the United Nations Charter in 1945. Books N More is proud to assist in distribution of The Human Rights Pocketbook Project, which was conceived by the Empathy Surplus Project, a federation of Caring Citizens’ Congresses, a 501(c)4 tax exempt organization. Visit http://bit.ly/joinESP. Rotarians adopted a resolution in 1940, in Havana, Cuba, calling for “freedom, justice, truth, sanctity of the pledged word, and respect for human rights ”that became the framework for the United Nations’ Universal Declaration of Human Rights. “Where, after all, do universal human rights begin? In small places, close to home - so close and so small that they cannot be seen on any maps of the world. Yet they are the world of the individual person; the neighborhood he lives in; the school or college he attends; the factory, farm or ofﬁce where he works. Such are the places where every man, woman, and child seeks equal justice, equal opportunity, equal dignity without discrimination. Unless these rights have meaning there, they have little meaning anywhere. Without concerted citizen action to uphold them close to home, we shall look in vain for progress in the larger world." Need recommendations for your next book club meeting? Want to know what other book clubs are reading? Check out our recommendations and buy your books online! Let us promote your book club on our website. Your club will be able track the books your club is reading, buy your books online, post comments about the books you are reading, plus you will receive 15% off all your book club books! (When you buy online tell us what book club you are with and we will give you 15% off when you pick you book up at Jen's Deli!) Email us at bmore@cinci.rr.com or call us at 937-383-7323 with any questions.